It is almost 0630 and I have taken a wrong turn. I pull off and ask directions from some local fishermen (real men do ask directions). I am on the right road now and in a few more minutes I pull up on the East Beach of Fort Desoto in St Petersburg Florida to begin my photography trip adventure (a 60th birthday present from my Editor in Chief). I meet Mr. Jack Rogers, my instructor, almost on time as the sun begins to fill the early Saturday morning sky. Jack is an award-winning photographer (and also a fellow Oceanographer) who really knows how to get down to the birds eye level and catch some of the most stunning bird photographs I have ever seen. I hope to learn some of his techniques and teachings as I take my first steps to bring my photography to another level. Hope you enjoy the results as much as I do sharing them! The first lesson I learn is that to shoot a good bird photo at times you have to be ready to get down and dirty. Jack said to bring at least four changes of clothes. I didn’t know he meant for one day! We spend the first part of the morning on our bellies photographing some of the migratory plovers and shorebirds. We then head to North Beach to the tidal lagoon and guess what? It is belly time again. 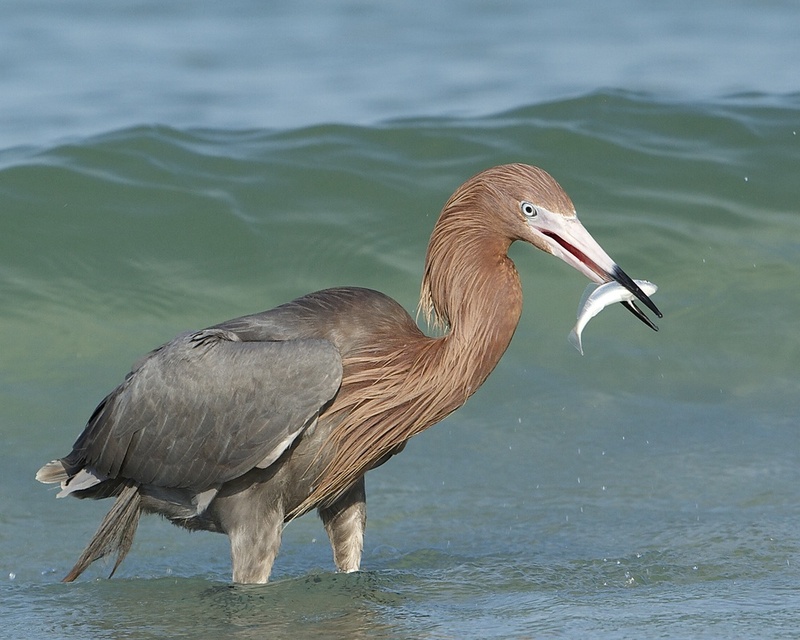 While there we spot a few Reddish Egrets (I shared a few photos of one of these from Huguenot Park a few weeks ago). We begin to follow them up the beach and down the beach. My huge telephoto lens I rented is beginning to feel like a ton of bricks. But I am so fascinated by the dancing antics of this large shorebird I ignore the 60-year-old backache. The egrets antics remind me of the “capote de Paseo” of the graceful matadors of Southern Spain whirling their capes as they taunt and dance around the charging bulls. 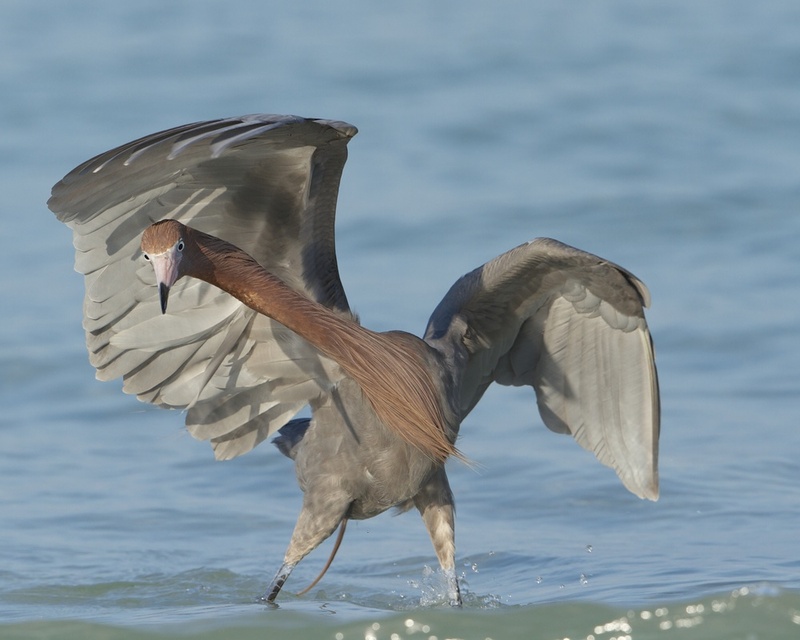 The Reddish Egret uses its raised wing like a cape to form a shadow over the water to possibly spook minnows or perhaps to better observe them in the shallow surf zones. 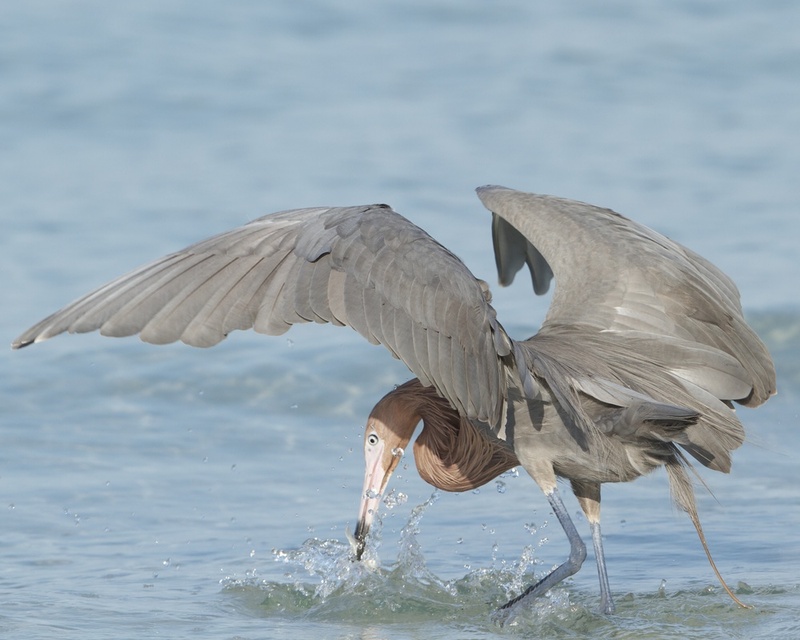 As the fish dart and turn, so does the Reddish Egret in stunning displays of feathers and dancing in the surf. 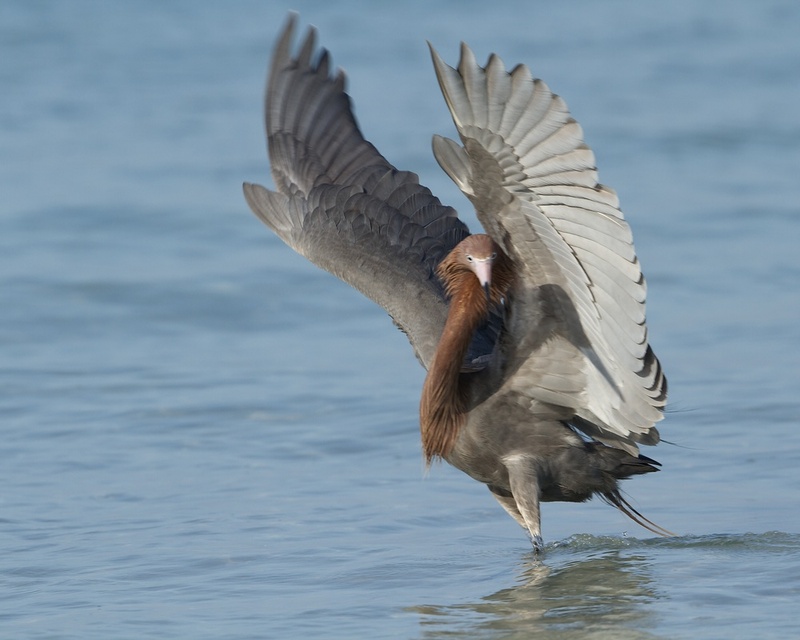 Then comes the “estocada”, the final thrust of the beak as it deftly nabs a wriggling fish from the surf and swallows it with joy. I am exhausted and dirty, but elated nonetheless. We pack our gear and head south towards Fort Meyers. In the evening we explore the beach and Little Estero Lagoon near the hotel. 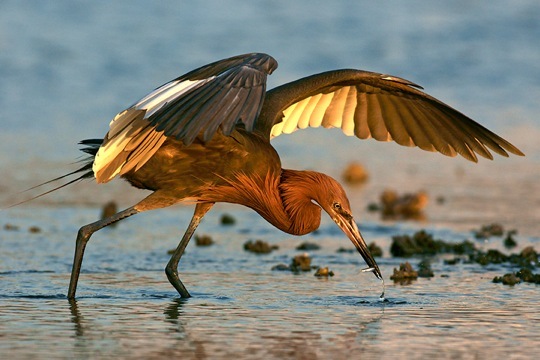 The shallow lagoon is home to several familiar species of shorebirds. There are Great Egrets, Little Blue Herons, Spoonbills, Snowy Egrets, a juvenile Reddish Egret, Night Herons, and numerous plovers and terns on the beach. Large portions of the beach have been taped off for nesting areas for the various plovers and Least Terns. Least Tern hatchlings are capable of leaving the nest when one day old, but they remain nearby. They can fly when they are 20 days old. The hatchlings are beginning to wander about taking their first steps. The Least Terns are very challenging to anything that comes close to the nests. As long as we remain low they are at ease but as soon as we stand up they launch on us and dive repeatedly at us to “shoo” us away. I observe them swarm over any raptor or large bird flying over the nesting area and pester them till they leave the protected airspace. Most of the danger to these nesting birds is from above by other marauding birds. However, the Creator of all things has been meticulous in giving these eggs and hatchlings the same cryptic colors of the surrounding sands and scrub so they appear nearly invisible from flying predators. The nests are small shallow indentations scraped out in the sand. Jack’s experienced eye helps me spot them. A solitary egg warms in the sun as the parents stand guard nearby. An unwary beach goer could cause great damage to these eggs in their nests if not aware of their presence by the posted stakes and warning signs. A Sanderling reflected in the sands. Sand flies as the Ruddy Turnstone searches for tidbits. It is down and dirty time. El Egreto de Rojo, the matador, proudly steps into the sandy Plaza De Pescados. Ole! The caped dance begins. Toro Toro taunts El Egreto (that means minnow in Egret speak). The dance of life begins. The estocada, the final thrust. The dance is over, to the victor, the spoils. And so the paseo begins again. Later a younger "Egreto" mimics his mentor. And the dance of life begins again. The Estocada of the younger Egreto. Photo by and courtesy of Mr. Jack Rogers. His work is amazing! A hatchling Least Tern's first steps. Three young hatchlings of a Wilson's plover take cover under the mother's wings. A Least Turn dive bombs a predator Osprey as it flies over the nesting grounds. 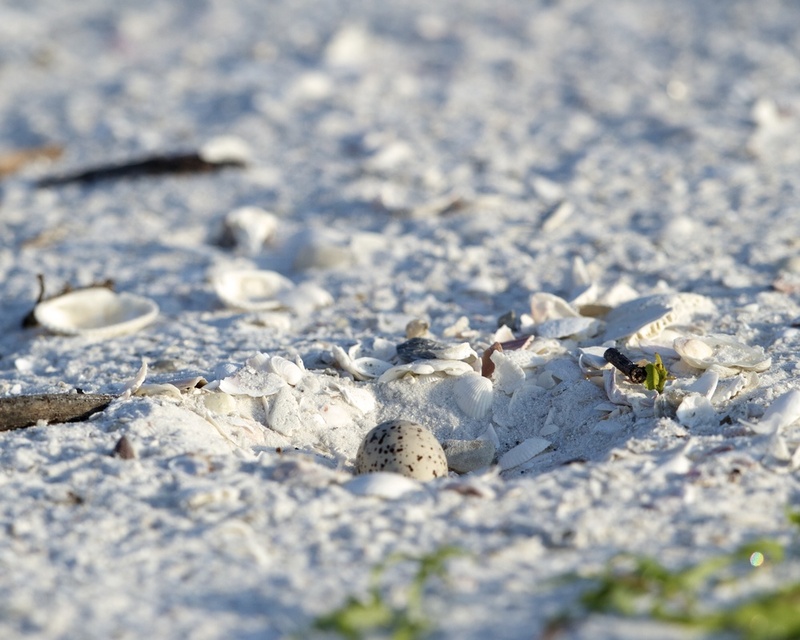 The lone egg of the Least Tern lies camouflaged in the shallow nest in the sand. Least Tern alerts as we approach the nest and hatchling. Scurrying as fast as its legs can go, this little "Fuzz Ball" plover hatchling seems to shout "I'm Flying! I'm Flying! The sun sets on day one of my adventure. Thank you Editor and Mr Jack Rogers!